Bringing together archaeological evidence and oceanographic testing, the team has shown that erosion from the Walbrook River can be credited with causing this mysterious phenomenon. The findings will be revealed in ‘Mystery of the Crossrail Skulls’ produced by True North, airing this Sunday (24 April) at 8pm on Channel 4, which explores a range of theories, including long-lost rituals. The Walbrook skulls have been known since the 1200s and numerous findings of disarticulated Roman skulls were recorded in the 19th century, including those found in a sewer in 1839 on Blomfield Street. In 2013, engineers digging for Crossrail discovered dozens of skulls under London’s Liverpool Street station. The theories as to their origin are various and include: decapitated victims of Boudica’s sacking of London, trophy heads collected by Roman soldiers and a continuation of the Iron Age ‘cult of the head’. The systematic excavation of a series of sites in the Walbrook valley, including most recently at Liverpool Street, has given archaeologists an opportunity to methodically study these remains in the context of the Roman landscape. The Walbrook Valley was a watery landscape in the Roman period and the river had a network of streams that flooded seasonally. The Romans tried to manage the water and archaeological excavation revealed a number of attempts to reclaim land. Today, the Walbrook River runs entirely underground and leads into the Thames by Cannon Street. Whilst studying the cemeteries set up by the Romans outside the city walls, MOLA archaeologists found burials close to the banks of the streams that were partially washed away by overflowing water. Working with researchers Charlie Hope and Samuel Griffiths from Ocean and Earth Science at the University of Southampton, archaeologists have been able to test how this fluvial (river) erosion carried the human remains downstream. 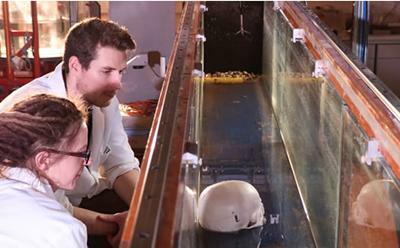 Using a flume filled with gravel, mirroring the conditions of the Walbrook River, Charlie and Samuel simulated what effects the impact of the gravel had on animal remains, chipping away at the bone to create a pocked marked surface. 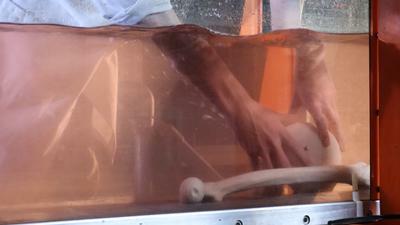 Placing a replica skull and long bone in a long flume that replicates the flow of the Walbrook River, it was established that the shape and buoyancy of the skulls meant that they bobbed or rolled over long distances, whereas long bones, such as leg bones, sunk with little movement. Analysing the skulls, osteologists from MOLA have identified a number of characteristics that corroborate this model, these include: shiny polished skulls where they sat in running water, pitted skulls where the gravels of the water bed chipped at the bone, and discolouration, staining and tide marks where the remains were waterlogged. Osteologists also recorded a lack of jaw bones, which indicates that the skulls came to rest when they were already disarticulated from the rest of the body.